Look out for the new Paul Oakenfold music channel, courtesy of joost.com. The channel features exclusive videos of Oakenfold’s performances from around the world, including videos of his current world tour. But, it gets better, just click ‘read more’ for a fantastic all expenses paid competition to see Paul Oakenfold live. 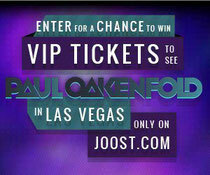 joost.com will be running a sweepstake as part of its launch and will be giving one lucky fan and a guest the chance to win VIP access to see Oakenfold perform at the Marque Nightclub & Dayclub at the Cosmopolitan in Las Vegas on March 31, 2012. The grand prizewinner will also receive round-trip airfare and two nights stay at the Cosmopolitan Las Vegas hotel. The competition is open until March 16th, so get over to joost.com for T&Cs and to get your entry in. Check out Oakenfold’s channel on the below link.